THE Foreign Office has been asked to investigate the mysterious disappearance of the father of Salma ElSharkawy, the Camden schoolgirl who was killed in a car crash last June. Foreign Secretary David Miliband is to be personally requested to look into the case of computer technician Walid ElSharkawy, 45, who has not been seen by relatives since Christmas Eve. He had gone to Egypt to visit his ailing mother and to see the birthplace of his daughter, who died aged 12 while in the care of Camden Council. Mr ElSharkawy was due to fly back from Cairo on December 24 and had arranged to meet his wife Mary O’Sullivan in his Regent’s Park flat, but failed to appear. The airline involved told Mrs O’Sullivan that Mr ElSharkawy had checked in for the flight but said he did not board the plane. The mystery heightened when Mr ElSharkawy’s mother Hanem Hassan, who lives in Alexandria, the second largest city in Egypt, said she received a phone call from him later that night to say he had arrived safely. Camden police say there is no evidence that he is in England and have closed the case. Mr ElSharkawy moved to England with his wife Mary in 1994, following the birth of Salma in Egypt. They moved to Camden a year later. Known for his expertise in computers, he worked with the BBC and the Arab TV news network Al Jazeera. Salma died last July in Derbyshire where she was living at an adventure care home. Mr ElSharkawy staged a protest outside Parliament in the aftermath, demanding the release of information about his daughter by Camden Council. Late on Tuesday, Ms Hassan made a desperate attempt to kick-start a search for her son after asking a neighbour to send an email to the New Journal on her behalf. Interpol, the Foreign Office, Holborn and St Pancras Frank Dobson MP and Camden police Missing Persons Unit have all become involved in the investigation. The Egyptian Consulate has not confirmed suggestions that he was stopped at the airport. Mr Dobson yesterday (Wednesday) pledged to ask Foreign Secretary David Miliband to intervene. He said: “If the police don’t believe he’s in Britain and the airline say he never caught the plane the simplest explanation is he’s still in Egypt. That’s why I’m going to the Foreign Secretary to enquire as to what’s happened to this British citizen. 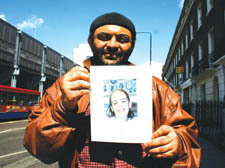 Mrs O’Sullivan said: “Walid wanted to go back because that’s where Salma was born. He went to the hospital where Salma was born and spoke to people who knew her. “Salma used to return to Egypt for holidays. It was really good for her to see her country. “He was in regular contact with me – he rang nearly every day. He sounded fine. He said he was looking forward to coming back. She added: “I feel the Foreign Office could probably do more. The missing persons unit say they have been told to close the case because they believe he is in Egypt. Mrs O’Sullivan said Mr ElSharkawy was always on the internet, updating his websites on his daughter’s case and replying to emails as soon as he read them. Since his disappearance, he does not appear to have touched his websites and has not replied to any emails. A spokesman for the Foreign Office said: “We have officially notified the Egyptian authorities of our interest and requested information about the matter. A Camden police spokeswoman said: “A thorough investigation has been conducted and officers have liaised with the relevant authorities. There is no evidence to suggest that he is currently in the country.